How are connected today’s 30-something Russians with their Soviet past? That must be one of the main questions behind Natalya Kudryashova’s debut feature film Pioneer Heroes (Pionery-geroi). Kudryashova creates an almost autobiographical film that tries to explore everything that her generation passed through during the abrupt process of de-sovietization of Russia. Pioneer Heroes had its world premiere at the Panorama section of the 65th Berlin Film Festival. Three school friends, Olga, Andrey and Katya, are in their mid-thirties and despite their personal challenges are currently struggling to find happiness in the lonely urban environment of modern-day Moscow. Olga (Natalya Kudryashova) is an actress who suffers from high anxiety and panic attacks when she finds herself in crowded places. Andrey (Aleksei Mitin) who as a kid wanted to invent the anti-death pill now has become a workaholic political analyst who stays always distracted and can’t communicate affectingly with his girlfriend. Katya (Darya Moroz) works in an important PR agency and her personal life is depressed as she’s in love with a married man. No one could predict their current situation in 1987 when they were attending school at Nizhny Novgorod and they were preparing themselves to become Young Pioneers. 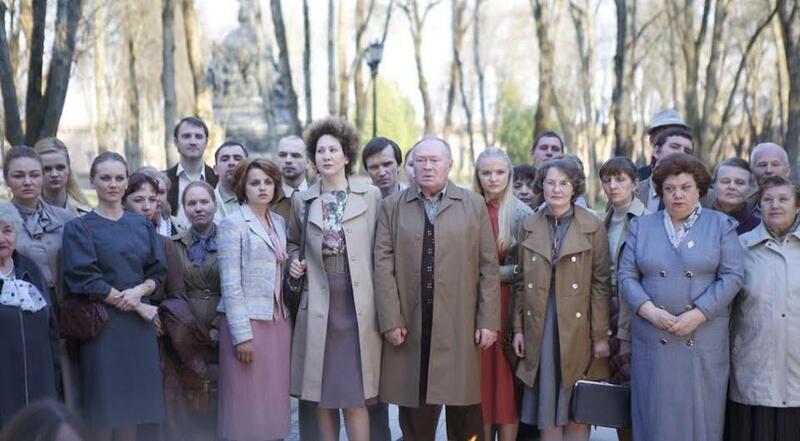 Pioneer Heroes is a divided film exactly as the lives of its heroes and as Russia still feels during this never-ending post-Soviet period. Everything is happening in two parallel worlds. On one hand there is the strangely hopeful but austere past of the innocent and “provincial” school years, when every comrade believed that he was building and creating the bright future of the great Motherland. On the other hand the cruel and cynical egocentric present that only leads to a bleaker future and doesn’t leave any room for collective sentimentalisms and everyman lives for himself. In reality these two separate worlds truly coexist as the one is being the flip-side, or the outcome, of the other. Kudryashova clearly divides these two worlds technically by using her camera in a still geometrical and vertical – Soviet – way for the part that unfolds in the past, while for the present she prefers a handheld nervous almost shaky camerawork that pursues extremely closely her heroes. Despite that obvious division the film seems quite balanced since the director creates some small an characteristic connection between the past and the present. Furthermore, Kudryashova, who also wrote the screenplay, drives her story to a less sociopolitical and more personal narration. In that way the created dipole is slowly flattened by touches of personal moments, which also sometimes lighten up and decompress the dramatic tone that naturally emerges. Of course, this effect sometimes perplexes the homogeneity of the story but at the same time adds some elements of reality to it. Taking into account that most of the screenplay is based on or adapted from true life events of the director and of her close friends, then this perplexity becomes even more palpable. Although, the director in her attempt to include everything and especially to overexpose her heroes’ past roles as Young Pioneers in today’s world sometimes misses her point of true reference. As a result, there are moments where the heroes lose their natural appeal and follow a more schematic and predictable path. This becomes even more evident at the film’s finale where everything has to be wrapped up in a hasty and almost unexpected way that doesn’t follow the film’s rhythm. Pioneer Heroes is undoubtedly and interesting and challenging theme especially for a debutant director who is also emotionally charged with the story. Natalya Kudryashova succeeded to transform her dreams and hopes into realistic and pragmatic needs as everyone of her generation did. Despite the fact that sometimes her ideas and emotions seem to overwhelm her, she manages to control her nostalgia and her thoughts and this becomes difficult especially when she has a limited experience as a director. In reality, her story is the story of broken heroes with destroyed expectations that try to survive in a hostile and unidealistic present and as it is expected no one prepared them for that. Abrahams Polonsky suggests that entrepreneurship is not so far away from criminality and that something is corrupted in the immaculate postwar American society. Václav Vorlíček created the first Czechoslovak absurd bond-esque espionage parody that still holds its cult status. Kafkaesque absurdity meets Soviet reality during the years of the extremely bureaucratic Perestroika in this deadpan comedy by Karen Shakhnazarov. Syllas Tzoumerkas' sophomore feature is a powerful sociopolitical drama that juxtaposes the cynicism of the troubled Greek society while the middle-class decays internally. Gian Vittorio Baldi directs a piece of art that through its consistency can work on political and dramaturgical level without losing its impactful realism. Society must chuck its petty prejudices and false idols and if necessary start again from a new beginning where men as well as women can be kind to themselves. The language of the image is emotion. Hope is invented by politicians to keep the electorate happy. I will stop wanting to wake up! Abomination, destroy me!